My family has a long history of military service, and I respect those who serve in the United States Armed Forces in anyway that I can. For instance, I was on a plane flying home from San Diego and a Marine and his training dog was seated next to me. When the food cart pushed past, I was delighted to pay for the soldier’s meal. Sometimes, it is the small acts of kindness that are the most meaningful to these men and women. 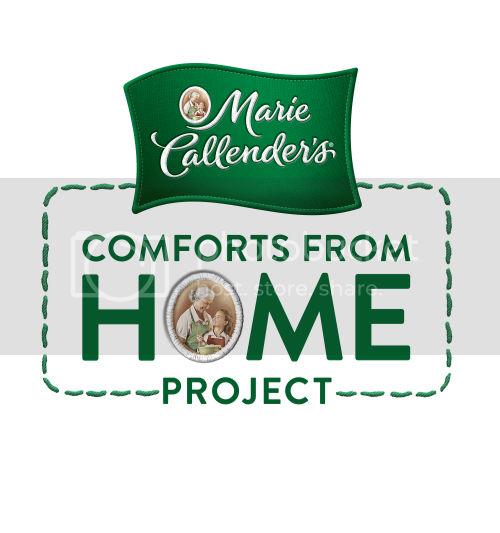 Marie Callender’s understand the need to support our military and has created the Comforts From Home campaign so that each time you purchase a specially marked package and submit the 8-digit code (on the back) before January 31, 2015, Marie Callender’s will donate $0.50 to the USO2GO program. USO2GO is a division of the USO, providing US Armed Forces overseas with care packages from home. These packages include electronics, games, sports gear, books, and more. The goal is to bring the comforts of home to remote locations around our globe, giving servicemen and women a chance to relax and connect with loved ones at home. The frozen dinners from Marie Callender’s a fabulous to keep on hand for nights when you are in a rush. My husband likes having them available for lunches when I have not been cooking and the stash of other possibilities is getting small. When he tasted the Creamy Chicken and Shrimp in Parmesan Alfredo Sauce, he said, “They did really good on this!” about four times. Yeah, he likes it! Of course, you can just pick up an individually-sized dessert for a proportionate treat. Marie Callender’s guarantees a donation of $100,000 but will give up to $250,000 with our help. All we have to do is purchase the special marked packages of Marie Callender’s frozen dinners and desserts and enter the codes. It’s a super-simple way to show that you support our US military serving overseas. And you can help spread this message, not just by sharing this post with others, but by visiting the Marie Callender’s Facebook and opting to participate in a Thunderclap message on November 30th. Help the USO & Marie Callender’s Meals bring the #ComfortsFromHome to troops overseas. Enter the on-pack code today! They MUST reach 250 supporters and when I signed up, they only had 33! Special details to remember: Marie Callender’s will donate at least $100,000 with a possible donation of $250,000 to USO2GO. You have until January 31, 2015 to enter the codes at ComfortsfromHome.com. Limit 5 codes per person.computer per day. Valid in the US only.